Simmer Tempeh in 2 tbsp soy sauce and enough water to cover for 10 min, remove from heat and allow to cool. Crumble Tempeh into a large bowl and combine with all other meatball ingredients. Shape into 1-inch balls. Place on baking sheet and bake for 15-20 minutes. Stir together all sauce ingredients in a bowl. Pour over warm meatballs and gently stir until covered. 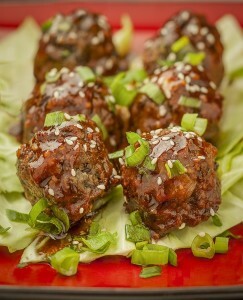 4 Responses to "Tempeh Asian Meatballs"
This looks like a recipe I would like to try, but you say to put all other meatball ingredients in to mix, but the recipe doesn’t separate which is which, what goes into the meatballs and what goes into the sauce?